A Foundation degree (or equivalent). 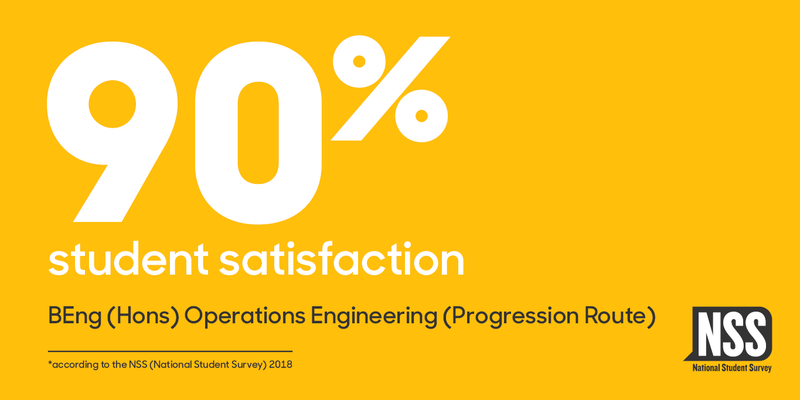 The BEng (Hons) Operations Engineering is an exciting programme offering a degree level qualification to Engineers from a wide range of backgrounds. This course will provide students with technical engineering discipline knowledge and skills, allowing them to understand engineering principles that underpin the design and operation of plant engineering systems and equipment. Students will gain knowledge and critical understanding of the well-established principles in their field of study and the way in which those principles have developed. Students acquire skills in analytical methods, plant and process principles, project management, engineering science and programmable logic controllers. Assessment is completed using a variety of methods including formal examination, case studies, written assignments, report writing, assignments that relate to the work place, plus practical projects. This progression route can be offered to students with 120 credits at Level 5 (relative to a suitable Engineering Discipline) which opens entry to those with a suitable HND. The progression route will allow students to complete a further 120 Credits at level 6 that include a Self-directed Dissertation in the final year. The BEng progression route is studied two evenings per week, usually the attendance will be between the hours of 5pm to 9pm. The course duration is 18 months. This module provides learners with an overview of a wide range of energy production systems in current use as well as those in development. It will focus on three main areas of energy production: fossil fuels [oil, gas and coal], renewable technologies [wind, water and solar] and nuclear. The module will provide learners with an overview of the technological, economic, social and political aspects associated with energy engineering and operations. These are used to discuss environmental concerns (particularly climate change) arising from the use of fossil fuels, and the potentially profound implications of future fuel (energy) scarcity (insecurity). Rotating machinery used in energy production, including steam, gas, wind and water turbines, will be covered. A knowledge and practical understanding of the technical, economic and management of the operation and on-going maintenance of energy production assets will also be provided. The design, operation and failure of components affect the whole of engineering and the manufacturing sector. This optional module allows learners with a Mechanical bias to gain knowledge of the main principles of product design along with the methodologies and techniques used in industry. The module will develop an understanding of what a project is and the role of a project manager, including how to plan design activities, set up, control and execute, and carry out reviews of a design project. The module will cover relevant theories used in designing components and the specific phenomena that lead to the failure of components in the wide variety of local environments. With the widespread use of distributed electrical power and power electronic drive systems, this module has been developed to meet the local manufacturing and industrial requirements for engineers to design and maintain electrical power and drive systems. East Anglia has a high level stake in the provision of both renewable and conventional Electrical Power Generation as well as a broad manufacturing base requiring electrical energy and drive systems. The module will focus on the analysis and design of efficient power distribution networks. It will also focus on the use of power electronics for the control of AC and DC machines as well as other manufacturing plant. This module assumes no previous knowledge of Computer Aided Engineering and is intended to provide the learners with a fundamental understanding of the use of Computer Aided Engineering. Within the design of engineering components and systems there is a growing importance for the use of CAD and Modelling Software. The Computer Aided Engineering module is a skill based module and will be assessed on as a pass or fail basis. The learner will use software to analyse the performance of different designs for components and be able carry out modifications to optimise their performance. Turbomachinery is widely used in the generation of power with this module focusing upon the design features, operation and operating characteristics of Turbomachinery such gas and steam turbines. Within East Anglia there are a large number of power generation facilities, with this module providing the underpinning theories that are used in the generation of power. These theories also transfer across to automotive and aeronautical engineering. The module will cover the applied thermo fluids theory for various types of Power Generation equipment, such as the heat transfer in heat exchangers, the fluid flow for steam turbines and combustion process within gas turbines. The module will also explore the principles of electricity generation and the associated systems. The Final Year Project is a major feature of any Bachelors Degree in Engineering. This module will allow for the undertaking of a substantial investigation in to a project of the learner’s choice. There is scope for the project to focus on the design of a component/system, the operation of specific equipment or the examination of a specific engineering theory. HNC Mechanical Engineering is offered as a part-time day-release programme over two years, although it is also possible to study full-time over one year. This programme offers progression to an Honours degree for students who have successfully graduated with a Foundation degree (or equivalent such as a HND) in Electrical, Electronic or Mechanical Engineering. Aimed specifically at those working as engineers and managers in roles of structural design, production and maintenance of the national infrastructure.